Kacey Musgraves looks like a perfect country music ingenue – until you notice her nose-ring and the punky peroxide streak in her chestnut hair. The 24-year-old Texan’s debut single is similar. It comes on gently – a banjo and a fingerpicked acoustic nudging a lovely singsong tune – but the story it tells is fierce and unblinking: a tale of small town America, where bleak prospects, bad marriages, and boredom are a young woman’s birthright. “Mary, Mary, quite contrary/We’re so bored until we’re buried,” Musgrave sings. It’s as poetic and potent as any song released in 2012 – an instant classic, a “My Hometown” for millennials. Shel Silverstein did a little bit of everything in his amazing career. A cartoonist, author, screenwriter, and much more, Silverstein will always be beloved among music fans for his songwriting output. Many of his songs were quasi-novelty numbers like “A Boy Named Sue,” recorded by Johnny Cash, and “The Cover Of The Rolling Stone,” which turned into a self-fulfilling prophecy for Dr. Hook & The Medicine Show. Those songs relied on Silverstein’s inventive, subversive sense of humor. For “Sylvia’s Mother,” also given to Dr. Hook for what was their very first single, it sounded on paper like another comical set-up: A would-be suitor’s desperate pay-phone call to his ex-girlfriend is intercepted by her protective mother. Yet the song, which hit the Top 5 in both the US and UK, turned out to be surprisingly moving, thanks in large part to the tender performance of Dennis Locorriere, who sang lead on the track for Dr. Hook. The only words that the narrator can get in are his desperate pleas to at least say goodbye, but Mrs. Avery realizes that he likely wouldn’t stop there. That’s where Silverstein’s structure gets it right. It’s fitting that the guy’s feelings and thoughts on the matter should go unheard, since he’s the odd man out in this situation. The anguish in Locorriere’s delivery says it all anyway. The early 70’s were a great time for sappy heartbreakers to break through on the AM dial, but “Sylvia’s Mother” is one that still holds up without any lingering aftertaste. Silverstein’s quirky talent, filtered through Dr. Hook’s earnest rendering, gets the credit for that. Anyway, the royalties probably more than compensated Shel for all that change he owed the operator. Her music, the equivalent of a smoke-filled whiskey-soaked back street bar when compared to the ultra slick, over-styled and over-produced country superstars that clog up the Nashville airwaves and give country music – as a whole – a bad (or at least misunderstood) reputation. The epitome of modern day Americana, Rose’s music is all aching telecaster twangs and weeping pedal steel – shot through with unapologetic hooks and melodies sweet like honey nectar. ‘No One To Call’ is the lead track from The Stand-In, Rose’s second album and the follow up to the universally acclaimed Own Side Now from 2010. Immediately punchier than previous work, Rose says of the new material “I have a tendency to work small so this album is like my first attempt at a high kick”. Flanked by band mates Jeremy Fetzer and Spencer Cullum, alongside a whole host of key Nashville players – ‘No One To Call’ sounds instantly timeless. Bursting out of the gates with a bar room honky-tonk swagger, Roses’ undeniable croon instantly disarming. Like all truly great country songs, it’s simultaneously heartbreaking and uplifting – life affirming even. 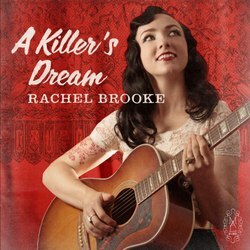 The Queen of Underground Country, the lovely and talented Rachel Brooke will be releasing her new album A Killer’s Dream on December 4th, featuring Florida’s Viva Le Vox as her backing band, and a duet with Lonesome Wyatt of Those Poor Bastards. This will be her 3rd full-length album. NASHVILLE, Tenn. – Marley’s Ghost – a virtuoso aggregation composed of singer/multi-instrumentalists Dan Wheetman, Jon Wilcox, Mike Phelan, Ed Littlefield Jr. and Jerry Fletcher – celebrates its 25th anniversary with the scintillating roots-music tour de force Jubilee (Sage Arts, June 5). The Flaming Lips-spearheaded collaborative remake of “In the Court of the Crimson King” is available now on limited edition multi-color vinyl at Dallas’ Good Records. Titled “Playing Hide and Seek with the Ghosts of Dawn,” this new version of King Crimson’s debut LP is also streaming in full at The Lips’ satelliteheartradio.com and will sell online in the near future.